In it’s 3rd year, this was our first visit to the festival. Mainly seated, there was a large friendly crowd and many familiar faces from the festival scene. Friday Night opened with Hokie Joint, relatively new, but already one of the best live bands on the circuit. These guys are an original and exciting 5 piece, fronted by the animated and gravelly voiced Jo Jo Burgess. Their catalogue of excellent songs has a fresh approach, pushing the boundaries while remaining true to the genre. Sam Kelly’s Station House followed, and a last minute change to the line up saw Sean Webster ably stepping in to the breach on lead guitar, and sharing vocals in a funky soul Blues extravaganza. Giles King joined them on harmonica for part of the set. Always a favourite with the crowd, Connie Lush And Blues Shouter were warmly received, and gave her usual friendly set of well known numbers. The evening powered to a close with The Nimmo Brothers rocking the house. Stevie and Alan are both great guitarists with their individual styles. Together it’s like witnessing a tornado whipping up. Saturday Afternoon started with our first experience of Errol Linton’s Blues Vibe. An authentic sounding R&B band with a little ska and reggae thrown into the mix which we enjoyed very much. The John O’Leary Band came next with a different line up since we last saw them. John allows plenty of scope for the band to showcase their talents and they proved that the standard of musicianship was as excellent as ever. John himself, a legend since his early days with Savoy Brown gave an admirable performance on Blues harp. We’d preconceived that former England cricketer Mark Butcher would be a novelty frontman carried by other musicians. How wrong we were. He is a riveting Blues guitarist and confident singer/songwriter. His tribute to recently deceased bass player, Mark Smith was an emotional moment which stirred the entire audience. The evening session started with Storm Warning, a different frontman from when we last saw them but as slick as ever. They played an set of original songs, mainly from their “Something Real” album and a couple of particularly good arrangements of old Pete Green songs. At the risk of repeating ourselves we can only say again how exceptional The Stumble continues to be, with an explosive set from their acclaimed albums which was ecstatically received by the Carlisle crowd. We have seen Earl Thomas solo and with his smaller band, but on this occasion he was backed my Paddy Milner And The Big Sounds. Earl is pure dynamite and with the big band behind him he was just sensational. With soulful vocals and plenty of energetic moves he soon had the audience eating out of his hand. It was party time, culminating with the whole band playing their way through the crowd. Sunday started with surprise guest Marcus Bonfanti and a great set of self-penned folk Blues. His warm and humorous banter endeared him to everyone and he made lots of new fans including us. The Producers followed, back after a 9 year long break with a different line up but still fronted by Dave Saunders and Harry Skinner. The set list came mainly from their large back catalogue and a selection of new songs, to the delight of the appreciative crowd. Tom Principato’s Powerhouse were up next. Tom is widely considered somewhat as a master of guitar, particularly the telecaster. His set reflected influences from throughout the USA and he demonstrated various guitar techniques along the way. Who better for the grand finale than Ian Siegal. He began with a solo acoustic set consisting mainly of songs from “The Dust”. The band joined him later, and as well as songs from the recent award winning “Broadside” album, Ian threw in some unrehearsed numbers that even took the band by surprise, but as always Andy and Nik coped admirably. They were willing to play and we could have listened all night long. 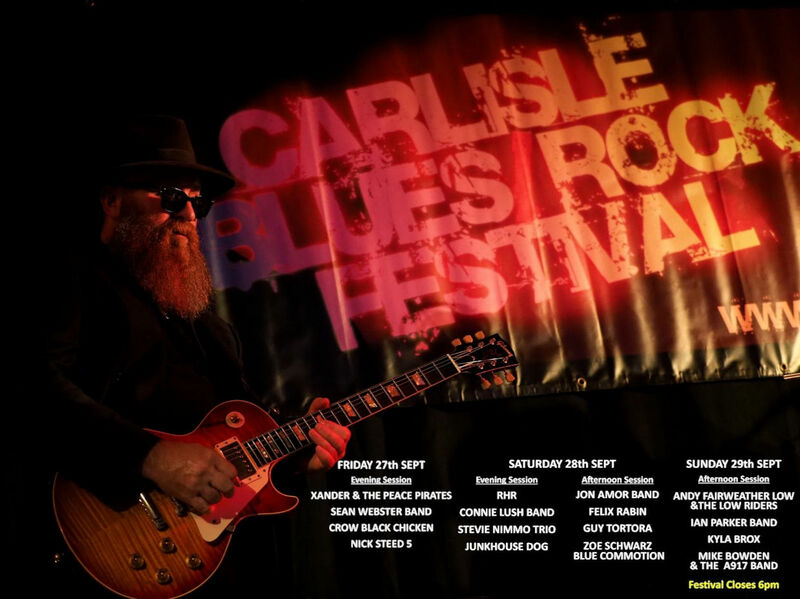 Carlisle is a serious contender for the position of Best British Blues Festival and they have the advantage of knowing what the fans want to see. Nice one Carlisle!